OK, I thought I had heard it all – I was a reporter during one of my other “lives” – but this is a new one. We’ve all heard about instances of cemetery vandalism – and been rightfully dismayed by the damage done to cemeteries and to tombstones, in particular. It has always seemed a particularly despicable thing to do – to me, anyway. Maybe it comes from growing up in a house that was right next door to a cemetery. Or perhaps because I have spent so much time haunting cemeteries doing genealogy research that they have a special place in my heart. Whatever the reason, I get really ticked off when vandals destroy and deface the final resting place of someone’s relative or loved one. In my humble opinion, the perpetrators deserve whatever the law decides to give them for their transgression. But what do you do when the “vandals” wear fur — and walk on four legs, not two? That’s the plight of a poor minister in England who has been patrolling his church’s cemetery looking for “stray” bones that have been disinterred (i.e., dug up) by some errant badgers. Yes, I did say b-a-d-g-e-r-s. 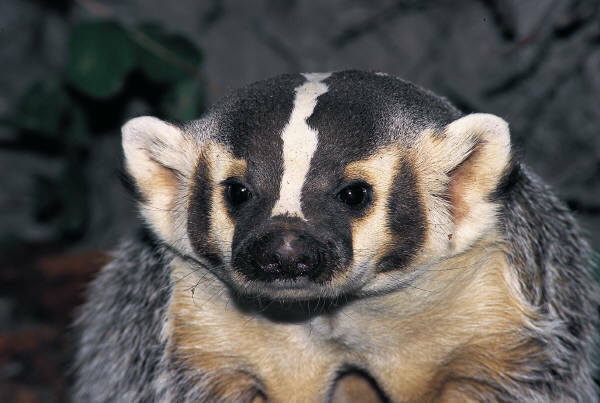 The little dark furry creatures with white stripes – and I don’t mean skunks. It is estimated that about four graves have been disturbed so far. In one instance, a child found a leg bone and took it home to his parents. Wouldn’t you have loved to see the look on his parents’ faces when he showed up at home with that surprise? I bet there was some interesting conversation around the dinner table that night! ““We cannot go near the sett, and English Nature will not grant us a license to relocate them so there is nothing we can do other than to let them remain in the churchyard, digging up the remains of people who have been buried for several hundred years. “It is ridiculous. If I decided to dig up a grave to build an extension for the church or something, there would be hell to pay, yet here we have people who are having their bones scattered at the whim of someone sitting in an office miles away. “It lacks any common sense but sadly reflects the bureaucracy of modern life. The field next to St Remigius Church is said to contain remains of the main residence of the Bozon family, Lords of the manor from 1304 to 1539. The field and graveyard are part of a Scheduled Ancient Monument and whilst Natural England were initially happy to grant a licence, English Heritage advised that if moved the badgers could cause more damage to the protected site. You can read more about this story in the Telegraph by clicking this link. This entry was posted in Genealogy News and tagged badgers, badgers threaten cemetery, cemetery vandalism, UK. Bookmark the permalink.